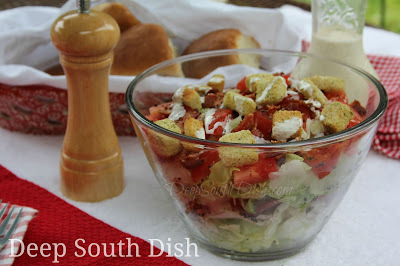 A layered salad made with thick cut bacon, crunchy iceberg lettuce, summer ripened fresh red tomatoes and substantial and chunky croutons finished with a homemade Ranch dressing. Pasta salads aside (which I adore), I love bringing a fresh garden salad to an event, potluck or cookout. It sort of balances out what seems to always be an overabundance of meats. In the summer, that is most likely some kind of a cucumber salad or a layered salad, and this BLT salad falls right into that category. I mean, who doesn't love a BLT sandwich to begin with, but turn those flavors into a salad and it's really a hit! The keys to a great salad, of course, are to start with a nice thick cut bacon, and add crunchy iceberg lettuce - none of that spring mix fancy stuff for this, thank you very much - fresh summer ripened red tomatoes - whole tomatoes sliced up and not cherry or grape tomatoes, and, standing in for bread, big, substantial and chunky freshly made croutons. Just thinking about it makes my mouth water all over again. Oven bacon is an easy way to get your bacon all done at once. Interestingly, it has become all of the rage here lately in 2015, but oven baking of bacon has been on bacon packages for as long as I can remember. Nothing new to see here! I used it all through my low carb days back in the day (yes, I have done that diet too) because when you eat low carb, you tend to eat massive amounts of bacon. Because you're starving all the time. I still like fresh skillet fried bacon the best of course, especially for breakfast, or for seasoning, but I use the oven method when I want to bake up an entire package of bacon at once for something like this. Then I have a few slices to spare in the meat drawer, just in case I want to use a slice or two for a sandwich or in a recipe. Lay the bacon out on a foil covered, rimmed baking pan - just simply for easier clean up - bake at 400 degrees F for about 15 to 20 minutes, depending on how thick your bacon is, and once the bacon is done, drain it on paper towels, but don't forget to save the bacon grease. You'll find a ton of uses for it here. The icing on the cake with this salad, is gonna be a great homemade dressing. I went with my homemade Ranch. But don't fret. Your favorite commercial brand will stand in nicely too. Check out more of my salad collection here on Pinterest! 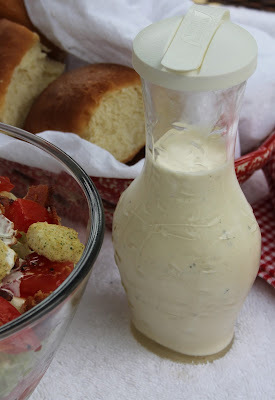 For the dressing, whisk mayonnaise together with all remaining ingredients, except for the buttermilk. Whisk in buttermilk as needed to reach desired consistency. Refrigerate at least 2 hours or until needed. 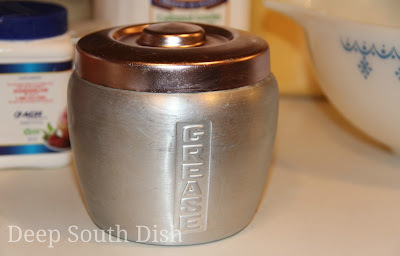 Whisk in additional buttermilk to thin, if needed, before dressing salad. For the salad, layer half of the lettuce in a large bowl. Top with half of the tomatoes and half of the bacon. Drizzle dressing all over and repeat layers. Top with croutons, drizzle dressing on top and offer any remaining dressing at the table. Cooks Notes: Try to make this as close as possible to when you want to serve it, rather than too far ahead, as the tomatoes tend to make the lettuce soggy otherwise. Do not add croutons until ready to serve. Leftover bbq chicken is a great add in. BLT Macaroni Salad: Omit the iceberg lettuce and croutons. Prepare a one pound package of elbow macaroni, al dente, according to package directions. Prepare dressing and stir in macaroni. Toss with tomatoes and bacon. Oven Bacon: Spread bacon on a foil lined, rimmed baking sheet, so that strips are not touching one another. Cook in a preheated 400 degrees F oven, approximately 15 to 20 minutes, or until crisp. Transfer bacon to paper towel to drain and reserve bacon drippings for another use.